I have been host to part of my family who have been visiting us for the last week. We have really enjoyed ourselves. I was bought a gift of Cedar and Lemongrass bath salts and Camomile, Sage and Shea butter hand cream. You can view soaps and creams being made on the premises. We also went for walks on the flaggy shore, picking our way across the limestone flags as the Atlantic crashed beside us and ending up swimming at the little beach by Mount Vernon, the seaside house that belonged to the famous Lady Gregory. We took the bikes to Coole Park, spent time wandering around the village at the market, visited the Aillwee caves and had a great night out and some delicious turbot at the new Gallery Café in Gort. 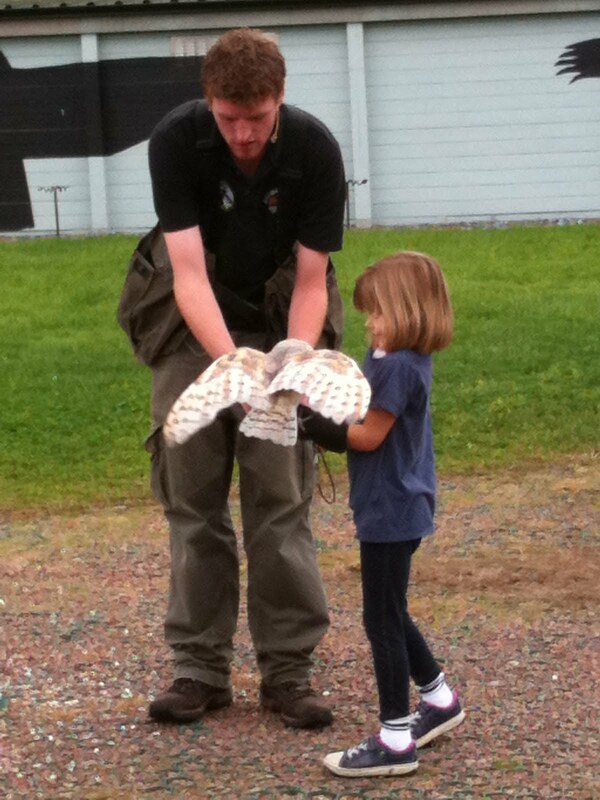 The Bird of Prey Centre at the Aillwee caves impressed everybody. (See the lovely Barn Owl above.) The Harris hawks displayed some amazing acrobatics catching food thrown in the air and the falcon showed phenomenal speed in dives from over 100 ft towards the lure. There is a great selection of owls and raptors that are in top condition, with beautiful aviaries and a fabulous location for flying. The highlight of the week had to be the Kinvara minors hurling match against Portumna. Somehow this was another quarter final match and not the semi final but obviously slightly more important as we were charged 5 euro at the gate, even if you were a player...that’s the GAA for you! Portumna are tipped as the best team in the group and at half time when they were a few points ahead we were already accepting defeat. But even though our hurlers are a year younger and a bit smaller they managed to catch a wave and ride it right up to land. It was a fast, skilful, controlled, desperate match. And just to impress the relations (as they leaned on the fence in the sun, confused with the score, shocked at the speed and ferocity of the hurling and startled by the expletives being fired over their heads by the supporters) my son scored a goal a couple of seconds before the whistle blew to put Kinvara in the lead by 1 point. 5-10 to 2-18, phew..now on to the semi?